Ferdie Hartzenberg was born in Middelburg on 17 March 1972. Ferdie Hartzenberg obtained a BA Technologiae Fine Art (Honours) at the Technikon Pretoria in 1997 with Sculpture, Art Theory and Art History as major subjects and ceramics as a sub Major for three years. Ferdie Hartzenberg spent 2 years traveling Europe and since his return in 1999 he has work full time as a sculptor working mainly in steel. 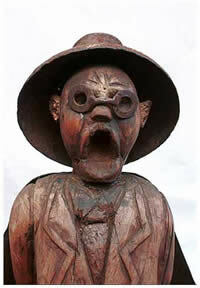 1996 - Ferdie Hartzenberg worked as part of a team on a life size policeman for the South African Police Services. 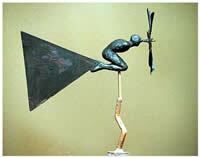 1998 - ABSA bank invites Ferdie Hartzenberg to submit a proposal for a large scale public sculpture for a new building. April to December 1999 - Worked as a stonemason for the British Museum, London.